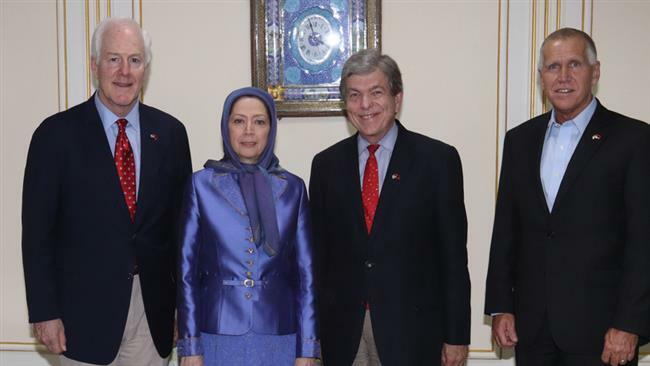 US Senators John Cornyn (R-TX), MEK chief Maryam Rajavi, Roy Blunt (R-MO), and Thom Tillis (R-NC) in Tirana, August 12, 2017. The MEK are a guerrilla movement fighting first against the Shah and later against the Iranian government, who were exiled first to Iraq and then to Albania. Albania houses 3,000 MEK members. Since last year, a slew of US politicians have visited the MEK in Albania, often without any public announcement, or under cover of meeting some Albanian politicians. These include former FBI director Louis J. Freeh, US Senator John McCain (who addressed a MEK conference), and a delegation of US Senators Thom Tillis, Roy Blunt, and John Cornyn. Now is the time to expand and spread the bastions of rebellion for freedom. I call on my compatriots across the country to rise up and join this uprising. The involvement of Giuliani and Gingrich, which follows the unilateral withdrawal of the US from the agreement with the Iranian government, is yet another sign of the increasing political support for regime change in Iran driven by the MEK members exiled in Albania.